The Expedition 53-54 crew members (from left) Joe Acaba, Alexander Misurkin and Mark Vande Hei. Misurkin is a Roscosmos cosmonaut making his second trip to the station. Acaba and Vande Hei are both NASA astronauts. Acaba is making his third trip to space. Vande Hei is about to embark on his first space mission. 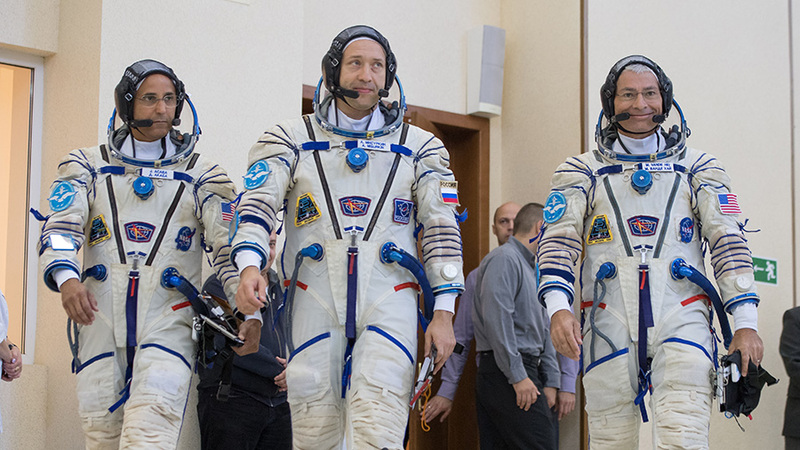 A new set of Expedition 53 crew members arrived at the Baikonur Cosmodrome launch site today ahead of their Sept. 12 liftoff to the International Space Station. NASA astronauts Joe Acaba and Mark Vande Hei along with cosmonaut Alexander Misurkin will take a near six-hour ride to their new home in space aboard the Soyuz MS-06 spacecraft. The orbiting Expedition 53 trio is checking out new exercise gear today that takes up less space and is more reliable than current station equipment. The crew is also getting ready to explore DNA alterations that occur when living in space. The new Mini-Exercise Device-2 (MED-2) is an order of magnitude lighter and smaller than existing equipment on the station. Commander Randy Bresnik worked out on the MED-2 today testing its ability provide motion and resistance workouts. Bresnik performed deadlifts and rows on the MED-2 to demonstrate the reliability of its small robotic actuators. The commander also set up a work area for upcoming work with the student-designed Genes In Space-2 experiment. The experiment will explore ways to observe how microgravity alters DNA and weakens the immune system. Flight Engineer Paolo Nespoli from the European Space Agency checked out physics and life science equipment today. The veteran astronaut cleaned and installed handrails on the Electromagnetic Levitation device then swapped out gear inside the Space Automated Bioproduct Lab. The station always orbits Earth at an inclination of 51.6 degrees to the equator. The station periodically boosts its orbital altitude to accommodate the different spaceships arriving and departing. Rarely, the station will make an orbital debris avoidance maneuver if ground trackers determine a piece of junk will cross the station’s orbital path.